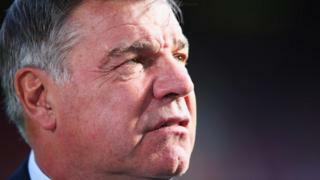 Manager Sam Allardyce praises West Ham's "heroic defending" as they beat champions Manchester City 2-1 in the Premier League at Upton Park. Morgan Amalfitano scored the game's opening goal in the 21st minute before Diafra Sakho made West Ham history by becoming the first player at the club to score a goal in seven consecutive games. Despite David Silva's brilliant reply, West Ham's fifth victory of the season leaves them fourth in the league, just one point behind City.